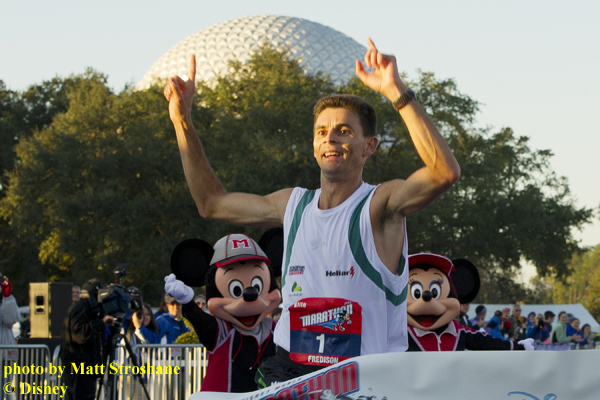 During this first full weekend of 2012, distance runners from around the world flocked to Walt Disney World for what has become one of the largest weekend of races in the country. 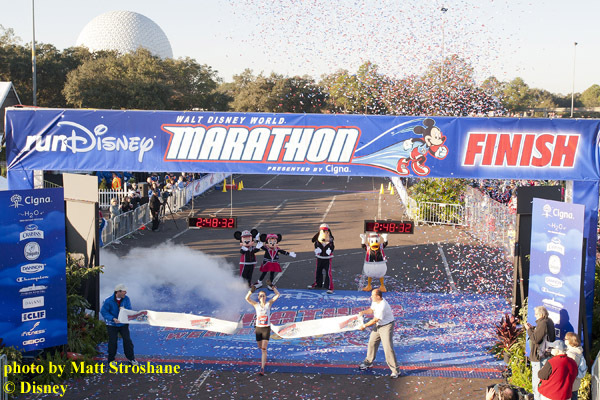 Over 56,000 people registered for one of the Disney races including: 8,000 in Friday’s Family Fiesta 5K, 26,500 in Saturday’s half marathon, and 16,500 for Sunday’s full marathon. In addition, 6,500 runners took up Goofy’s Race and a Half Challenge, which required completing both the half and full marathons. You didn’t have to look hard for inspiring stories among the participants such as reality TV star Ethan Zohn (Survivor/Amazing Race) battling leukemia and raising money for cancer research. In addition, four wounded veterans ran as part of the Achilles Freedom Team supporting disabled runners. Personally, I was inspired from the many friends I have made via the DISboards ”W.I.S.H.” (We’re Inspired to Stay Healthy) forums who had the courage to commit and stick to a healthy lifestyle. I tip my hat to everyone who participated in the runDisney races. Continue after the break for videos, photos, and more details from the weekend’s events. Or the even more inspiring story of the American Veteran who lost both legs but still completed his first half marathon as part of Team Achilles. 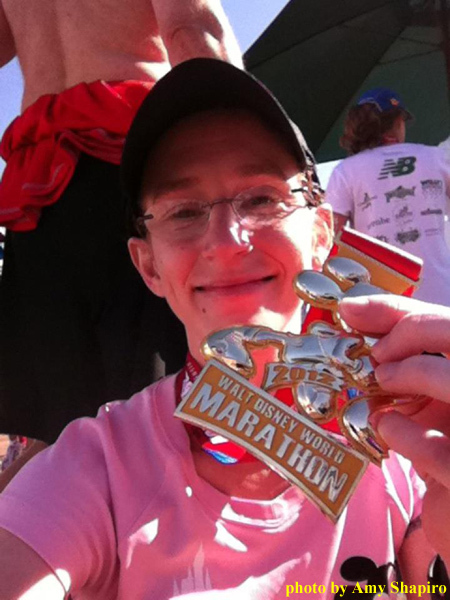 There were quite a few DISer’s participating in Saturday’s half marathon including Lisa Tully who excitedly posted “I did it! My First Half Marathon!” Upon finishing his first half marathon DISer Chris Heinrichs planned on showing off his shiny new medal around Epcot. Congratulations to our friends Lisa and Chris; we’re so proud of you. On Sunday, competitors towed the line at 5:35am for the start of the 26.2 mile full marathon that took them on a journey through all 4 Walt Disney World theme parks. For the second year in a row, Brazilian Fredison Costa edged out countryman Adriano Bastos (by 14 secs) to win the race in 2:19:01. Renee High of Virginia Beach, VA was the first woman to cross the finish line and captured the female title in 2:48:33 – a good warmup before she heads to the US Olympic Marathon trials next week in Houston, TX. 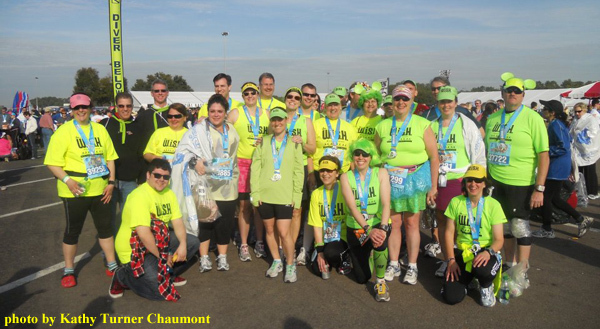 Official runDisney training consultant Jeff Galloway has completed all 19 Walt Disney World marathons. After crossing the finish line with his wife at this year’s event he was asked what he’s doing next – Galloway’s proclaimed, “I’m going to Disney World!” Over the course of the weekend, runners from all 50 states and 60 different countries took part in one of the Disney Marathon events, but nothing captured the satisfaction quite like the smile of DISer Amy Shapiro upon becoming a marathoner. Whether you wheeled, walked, ran, or crawled to participate in one of this weekend’s runDisney races, we here at the DIS Unplugged salute your dedication and achievement. Next up on the runDisney calendar is the Inaugural Tinker Bell Half Marathon, a new half marathon on Sunday, January 29th, 2012 run in and around the Disneyland Resort in California. This is a can’t miss event, especially if we raise $2,000 for Give Kids The World. If we meet that fundraising goal, DIS Unplugged Disneyland Correspondent Tony Spittell will run the race in a Tinker Bell wings and tutu. Come on! Who wouldn’t want to see that? 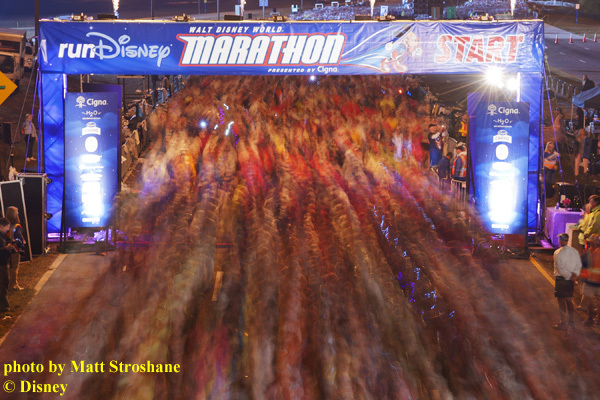 It’s Marathon Weekend here at Walt Disney World!